The first instant terrarium water conditioner. Great for reptile water bowls, chameleon drip water systems, amphibian enclosures, and aquatic turtle tanks. 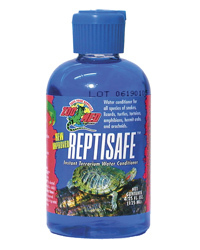 ReptiSafe removes chloramines and chlorine, detoxify es ammonia and nitrites, and provides essential ions and electrolytes which help to hydrate newly acquired animals. Also stimulates slime coat development in amphibians and fish.